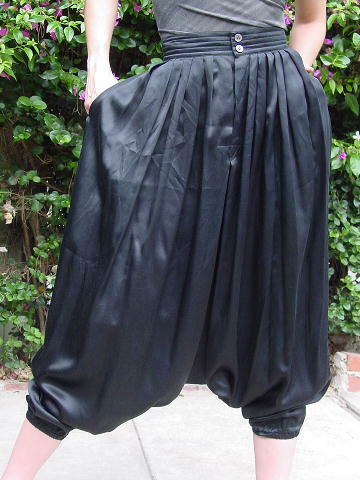 These vintage Calvin Klein black modified harem/genie pants are 100% pure silk and were made in the Crown Colony of Hong Kong. They have a 3 small iridescent button "fly", which is covered by a placket. There is a 1 7/8" wide waistband with five horizontal rows, separated by stitching, a 2 button and 2 eyehook front closure, and the waistband has (on the back to the right of center) 4 tiny snags. 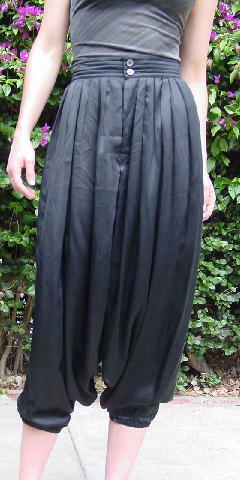 There are pleats extending downward from the waistband front and back. The right front of the waistband has some small indentations from a hanger. The leg openings are 5 1/4" in diameter and have elastic. There are 2 side hidden slash pockets. It's nice soft fabric and an unusual design. waist to bottom center 30 1/4"
waist to bottom side seam 39"
bottom center to leg opening 8 1/2"